Mandela's death yesterday was certainly no surprise — indeed, obituary writers have had their copy prepared for some time — and yet I was deeply shaken. Though I have some South African acquaintances, I've never been there. Mandela's death has no practical effect on my life, because the Mandela I know is an image, a recording, a representation, something beyond his body's life or death. And yet it is wrenching to think that we now live in a world without Mandela. There have already been countless tributes, of course, some excellent. (Keep your eyes on Africa Is a Country for some of the best. See also Timothy Burke's excellent "Be Nelson Mandela". And Ta-Nehisi Coates' "Apartheid's Useful Idiots".) 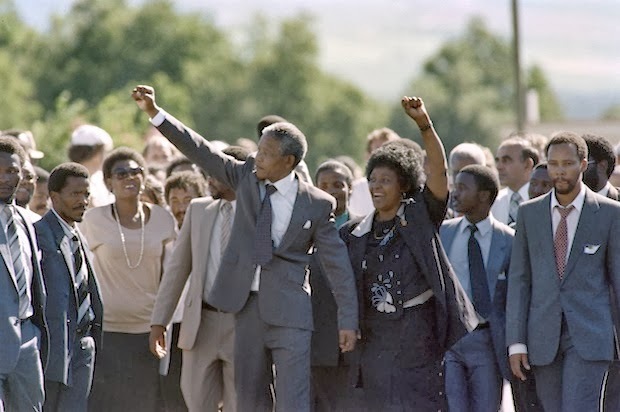 Here, I want to note the moment, to remember just how sad it felt to live in the hours after Mandela had gone, and then to replace the sadness with the memory of the hopeful happiness I felt that day when I was 14. When I was among the crowd I raised my right fist and there was a roar. I had not been able to do that for twenty-seven years and it gave me a surge of strength and joy. South Africa (its image, history, literature) has haunted me for as long as I can remember. When I was growing up, a family friend was South African. She was an entomologist and a reader of science fiction, and she gave me one of the very first science fiction books I could call my own: The Science Fiction Hall of Fame, vol. 1. (I still have it.) I know my parents talked with her some about her home country, about her occasional trips back home, etc., but I don't remember any of the details. My father, good Reagan supporter that he was, probably felt wary about the ANC and Mandela, but he also abhorred overt racism, and I remember more than once a news program showing some ultra Nationalists in South Africa and my father saying how much they looked like Nazis. I remember being very young and wondering what was happening in South Africa and who was right and who was wrong. I knew the Soviets were wrong in Russia and the Sandinistas were wrong in Nicaragua, but I couldn't figure out South Africa, and it bothered me. The first record I ever bought for myself with my own money was Paul Simon's Graceland, which further brought South Africa into my consciousness. I remember seeing Simon on 60 Minutes or another show, talking about the making of the album, and it was somewhere around then that I decided the white government in South Africa must be horrible, even if Ronald Reagan (our hero) kind of supported them. I graduated from high school in May 1994, the same month that Mandela was inaugurated as the first democratically-elected President of South Africa. By then, I had read a lot about the country, and sometime in the next few years I took his autobiography, Long Walk to Freedom, out of the library and read it. I kept borrowing it from the library over the years. Finally, a few months ago, I bought a copy. Some books you really ought to own, even if — especially if — they live inside you. People will feel I see too much good in people. So it's a criticism I have to put up with and I've tried to adjust to, because whether it is so or not, it is something which I think is profitable. It's a good thing to assume, to act on the basis that ... others are men of integrity and honour ... because you tend to attract integrity and honour if that is how you regard those with whom you work. And one has made a great deal of progress in developing personal realtionships because you [make] the basic assumption ... that those you deal with are men of integrity. I believe in that. My last year at NYU, I had a screenwriting class with Richard Wesley, who had just finished writing the script for Mandela and de Klerk. He told us some stories of working with Sidney Poitier (who he'd first worked with on Uptown Saturday Night), and of his research for the film. I had no access to Showtime, no way to see the movie when it aired, but my father agreed to videotape it for me. He called after watching it and said it wasn't bad, and was pretty informative, actually. The screenplay I wrote in Richard's class was a comedy about radical environmental activists, loosely based on some of my own experiences, and we had good conversations about politics and social movements, including the ANC and the anti-apartheid struggle. They must know why they are going to take up arms and fight. They must be taught that the revolution was not just a question of pulling a trigger and firing — it was an organization that was intended to take over political power. That is what we stressed. Somewhere around 2001 or 2002, I was teaching a high school Advanced Placement Literature class and mentioned the word "apartheid" in passing. None of my students knew what it meant. I was so angry I almost couldn't speak. I knew their ignorance wasn't their fault. But it had never occurred to me than anybody could not know what apartheid was. I decided to devote the entire last third of our course to South African novels and short stories. This required some research on my part, because I had never had an African literature course and had only ever read a few of the really famous books. I'd thought I knew something about South African history, but soon came to realize how superficial that knowledge was. Luckily, I lived near a library with an improbably excellent collection of African fiction. I educated myself as best I could in a fairly short amount of time, then had my students read such books as You Can't Get Lost in Cape Town and Welcome to Our Hillbrow, as well as numerous short stories and poems. We all learned a lot together, and my commitment to teaching African literatures was solidified. It would be inaccurate and hubristic of me to claim any expertise in African literatures and histories, but nonetheless I teach both whenever I have the chance, because most of my work has been in New Hampshire, to majority white populations, to people who often come from backgrounds similar to my own, and I am still furious that I never once had the chance to read a single work of African fiction or history in school until I was working on my master's degree. I teach to be the teacher I wanted to have when I was 14 years old and Nelson Mandela walked free for the first time in 27 years. When I designed that term on South African literature, my department head was a bit nervous. Were these books really useful to the students? Weren't they, well ... esoteric? I shrugged. "No matter what," I said, "these students will graduate with a new knowledge. They will know what apartheid was. They may dislike the books, they may dislike me as a teacher, I don't care. They'll know what apartheid was. That's enough for me." Still, there was Mandela. A great man we have been honored to share some time on Earth with. A man who made us imagine a better world. The image of a great man — the representation of an icon — reached a boy in rural New Hampshire, who then, in wondering about that man, learned to question the apparent truths of the world, and learned to overcome the fear of people different from himself, and began to hope for a more open, just, and compassionate future than the present he inhabited. In mourning the great man, I remember the little boy, and within the tears of loss there flows again a hope for a future that will approach our dream of it.